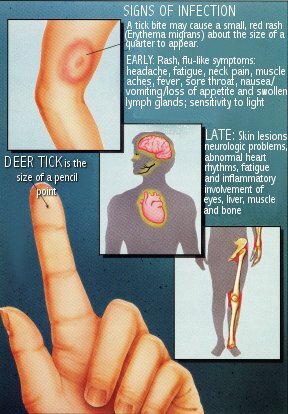 Lyme disease is caused by the bite of a deer tick. The bite may result in the appearance of a small red area on the skin (about the size of a quarter) that fades in a day or so. When recognized and diagnosed in the early stages of infection, Lyme disease can be cured by antibiotics. If the infection spreads, in a few weeks or months, complications, such as arthritis in the large joints and nervous system ailments, can develop. A tick bite may cause a small red rash to appear on the skin that fades in a day or so. Lyme disease is a tick-borne illness first identified almost 20 years ago in Lyme, Connecticut. The largest number of cases now occurs in New York, Pennsylvania, Connecticut and New Jersey. In most patients, it begins with a local rash in the area of a bite from an infected deer tick or, on the west coast, the western black-legged tick. If the area of redness becomes an enlarged circle with a clear center, this reaction is referred to as a “bulls eye” or erythema migrans and is found in about three fourths of patients with Lyme disease. This skin lesion develops between 3 to 30 days after the bite from an infected tick and requires antibiotic treatment to prevent the disease from progressing. In some patients, this rash is accompanied by flu-like symptoms, such as headache, fatigue and fever. 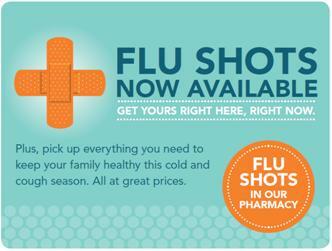 The symptoms of this early infection last 3 or 4 weeks if left untreated. If the infection spreads, in a few weeks or months complications such as arthritis in the large joints and nervous system ailments can develop. Eventually, after months or even years, about half of those patients not treated will develop serious arthritis, fatigue, neurologic complications and possible involvement of the eyes, liver, muscles and bones. Often these patients never developed the early symptoms. Avoid Tick Bites: Lyme disease is caused by a spirochete known as Borrelia burgdorferi. It is spread to humans by the bite of an infected tick, which must remain attached to a person’s skin while feeding for 24 to 48 hours in order to transmit the spirochete to the human. Only a small percentage of the ticks in a geographic area are infected with the organism, so not all tick bites result in Lyme disease. Tick bites can be avoided by staying away from tall grasses or ground covers, keeping socks tucked over pant legs, wearing light colored clothing to better identify ticks and wearing an insect repellent containing DEET (sparingly for children’s skin). Once a day, a careful inspection for ticks should be performed, and if a tick is found attached to the skin, it should be gently removed with tweezers close to the skin without crushing it. Laboratory Tests: Although a laboratory can test a tick for the Lyme-causing spirochete, it is usually not recommended since a negative test could be false and a positive result does not prove the tick transmitted the spirochete. There is a blood test to determine the body’s response to the spirochete infection, but it is often negative early in the disease and other diseases can cause a false-positive result with this test. A positive result is confirmed with another laboratory test known as the Western Blot test. For the majority of patients the diagnosis is based on the appearance of symptoms. The treatment for Lyme disease is antibiotic therapy usually for 3 to 4 weeks by mouth if the infection is diagnosed in its early stage.